HOUSTON - Colby Rasmus and the Houston Astros sent a message to the Kansas City Royals. 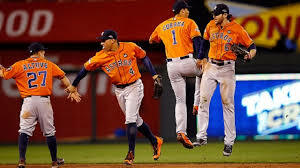 In an ALDS rematch, the Astros combined for 14 hits for an 8-2 victory in their first meeting this season. Collin McHugh tossed 7 scoreless innings to get the win.